27th Pune International Marathon. He is survived by two sons and two daughters. Deshpande ws bearing chest number 27 acollapsed near Vijay Talkies on Laxmi Road. Police constables who had been deployed rushed Deshpande to Poona Hospital. Later, the doctors declared his death due to cardiac arrest. Mr. Deshpande retired from RMS Railway Mail Department employee in 1981. Then started his athletic career at the age of 65. He has been running for over 25 years now and he has ran in over 325 events in India and abroad. He had taken up running to improve his health and was also encouraging his son to take part in it. He bagged a gold medal in an athletic meet in Sri Lanka. Lack of sponsorship forces him to spend money from his pension to participate in national or international events. 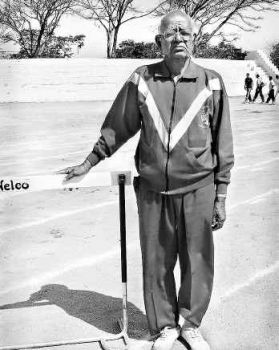 Srikrishana Deshpande was an example for the youth when he ran, he took part in all the prestigious marathons held in the country and his main aim was to be fit. A Warrior died on the battleground. Really we have lost great Superman of Belgaum. Down to earth , very very simple person,humble. Its very schoking to hear that Deshpande Ajjari as we fonldy addressed him has sprinted his last. He has taught us a new way of looking at life after 60. He breathed his last doing what he loved. RIP YOUNG MAN and May God give his family the strength to overcome his loss. PS: Dear AAB this is a second instance that sitting here in Germany far from Belgaum I am coming to know of the sad news of the demise of a dear one almost immediately , which otherwise would have taken a long time. You are keeping us rooted Belgaum. Have been following his running career since my own childhood. He was a great sportsman and an inspiration to many. A person loved by one and all who knew him. It was sad to hear about his demise. But he spent his last breath doing what he enjoyed doing. I pray to the almighty to rest his soul in peace and may God give strength to his family. A warrior died on the battle ground. That is what i can say for this (Super)man. Sir you are the real YOUTH icon of Belgaum.